CCI Pakistan has appealed for prayers, solidarity and support after militants attacked a Christian neighbourhood following an attack on a Christian neighbourhood in Lahore after allegations of blasphemy by a local resident. The leadership of Pakistan’s National Commission for Justice and Peace (NCJP) also condemned the incident in strong terms, including the registration of a false blasphemy charge against Sawan Masih and the incidents of burning, arson nearly 178 houses of Christians in Joseph Colony Lahore. Fr Emmanuel Yousaf Mani the National Director, Peter Jacob the Executive Director, NCJP said in a press statement that the police and administration was mainly responsible who allowed the situation to develop for 24 hours into a tragedy in the heart of Provincial Capital. However the political leadership in the country also did not find courage to address the sufferings of religious minorities especially those related to abuse of blasphemy laws. According to media report (The News, March 9, 2013) about two to three hundred people gathered around Joseph Colony in search of the accused to kill him. 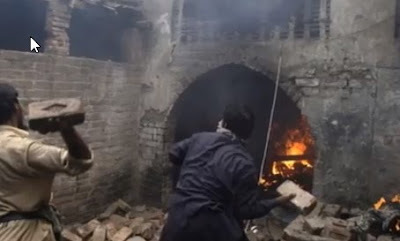 Not finding him at home, the mob attacked the house Savan, burnt it partially, pelting bricks at other houses where around 170 -175 Christian families were residing. They found his 65 year old father and beat him. The locality is inhabited by low income families/workers mostly earning daily wages. As a result of incident, the inhabitants (Christian community) fled their homes/ locality for safety reasons. The incident started at 1 pm and continued till evening. The police reached the scene to control the situation but it was too late. The mob of 3000 people again attacked the Joseph colony, pelted stone and set 175 houses on fire. Majority of the houses have been completely damaged while the others have been badly damaged. According to the news paper, The News of March 9, 2013, Savan is currently under arrest and has been moved to the undisclosed location.